‘You need wrist extensor strength to hold powerful positions of finger flexion, in other words, to be stronger with your finger pulling. A strong wrist acts like an anchor for the fingers. PowerFingers is a practical, easy-to-use alternative to the rice bucket training I prescribe for climbers. The ability to double up the bands is an easy way to increase resistance. The size of the flexor tendons can increase in size due to increased activity of the flexor muscles / tendons during activities such as gripping, typing, etc. These activities directly exercise and strengthen the flexor muscles / tendons, causing them to become shorter and thicker, than normal, resulting in decreased space within the carpal tunnel and the compression of the median nerve and blood vessels. 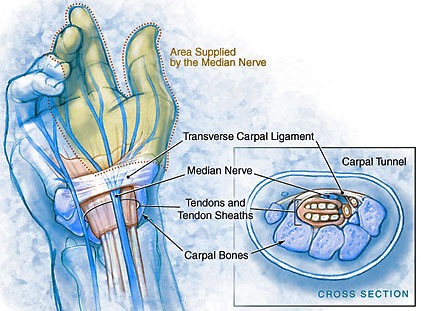 The solution to reducing the size of the flexor tendons is to stretch and lengthen the flexor muscles / tendons, resulting in increased space within the carpal tunnel and the elimination of the impingement of the median nerve and associated vessels.